Saving energy is essential for mobile computing users to extend the battery life of the device. Lowering the energy consumption has a direct effect on the energy costs. Reduced energy usage can on the other hand impact a PC's performance up to the point where it is no longer reasonable and needs to be turned off completely. Granola, formerly known as MicroMiser, is a energy saving software for Windows and Linux computer systems that uses algorithms to find the ideal balance between energy saving and performance requirements. It works in this regard much like similar applications such as Local Cooling or Edison that we have reviewed in the past. The cross-platform application Granola offers an unobtrusive method of saving energy. It concentrates its energy saving efforts on the cpu by using dynamic voltage and frequency scaling technologies. It basically means that the cpu will be lowered or raised depending on the power requirements of the system. Granola runs quietly in the background displaying energy saving information in its interface when opened. This includes the projected kWh, money and CO2 that is saved yearly if the software is used throughout the year. 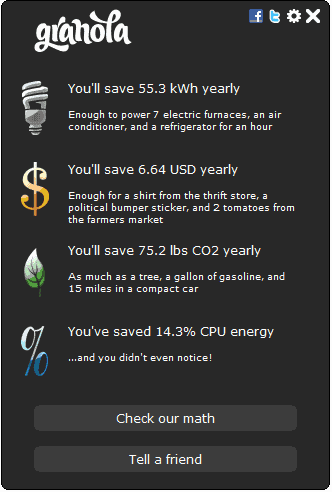 Examples are given on how much energy is saved. It is possible to save some energy with Granola. It would be nice if the software would not only regulate the cpu energy consumption but that of other PC hardware as well. It is possible to use the standard power saving options to do that but a software that would handle all of those to compute the energy savings would be more than welcome. How do these programs compare to RMClock? Anyone made experiences with both. The embedded Intel SpeedStep already does this regulation, no software needed! So does AMD’s Cool ‘n Quiet. I smell a rat.